Lendor Consulting: Firefighter or Fire Marshal -- Which Are You? 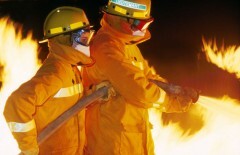 Firefighter or Fire Marshal -- Which Are You? You feel like you are always behind the eight ball. You are always reacting to situations. You are consistently playing catch-up. You tell yourself that if you want something done right/well/now, you have to do it yourself. You are doing the day-to-day activities and are down in the weeds. You function at a strategic level. You effectively manage up and out. You plan ahead and develop contingency plans. You identify and develop the appropriate skills, relationships, and resources, both within and outside of your team. While you can step in and do the day-to-day aspects of the job, you play a more managerial role. You step back and allow your staff to take care of the day-to-day, and serve as a resource for them. You shield your staff from the heat from above. It is nice to be a firefighter, be front and center, and get all of the glory. However, even firefighters want to be promoted so they are not in the thick of things every day. What three things do you commit to doing so you will be seen as a fire marshal?